You would love to replace your missing teeth with dental implants. And for good reason — they're the best way to restore life-like, functional teeth. But there's one problem — implants and fixed bridgework (the next, best option) are financially out of your reach. 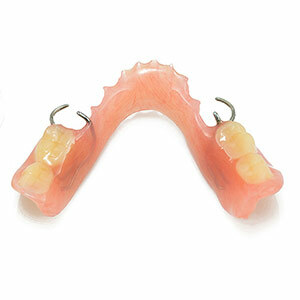 There's another viable option, though, that might fit your budget — removable partial dentures (RPDs). Similar to full dentures, RPDs replace only the missing teeth in a dental arch. And they're much less expensive than implants or bridgework. RPDs are custom made to fit an individual patient and their particular missing teeth locations. Their frameworks are usually made of vitallium, a strong but lightweight metal alloy. With vitallium, the frame can be made thin enough not to be noticeable but still conduct sensation. A pink resin or plastic that mimics gum tissue covers the frame, to which we attach prosthetic (false) teeth made of porcelain, glass-filled resin or plastic to precisely match the missing teeth locations. The RPD is held in place with small metal clasps that fit around remaining natural teeth. RPDs are designed to minimize movement and avoid undue pressure on the gum ridges, which could accelerate underlying bone loss. In certain situations, though, the location of some missing teeth could complicate matters. If you're missing a tooth in the back where the appliance coverage ends, the RPD may not be as stable. The solution, ironically, could be a dental implant placed strategically at the end of the RPD, where it connects securely with the appliance. You would only need one or two implants, which won't dramatically increase costs. One thing to remember with an RPD: they tend to accumulate bacterial plaque, the trigger for both tooth decay and periodontal (gum) disease. That's why it's important to practice daily effective hygiene by cleaning the RPD and your remaining teeth and gums, as well as taking the RPD out at night. A well-maintained RPD could last for many years. With this appliance you can still have functional teeth and a winning smile, even without implants.